After the melting of the last Great Ice Age, sea levels were 1-2 metres higher than we know them today. When sea levels subsided to their current levels, fresh water from the Dandenong Ranges flowed into low lying regions. Carrum Carrum Swamp, an extensive wetlands ecosystem was created, an area encompassing some 5000 hectares from Mordialloc to Frankston and inland towards Dandenong. Kananook Creek (the major outlet) and Mordialloc Creek carried excess water from the wetlands into Port Phillip. These creeks were also fed by Dandenong Creek with headwaters in the Dandenong Ranges, Eumemmerring Creek, with headwaters at Narre Warren, and a number of smaller streams. The course of the Kananook was controlled by the formation of a north-south dune system running parallel to the bay. Teeming with aquatic life, bird life, mammals, edible bulbs, roots and innumerable sources of food, Kananook Creek and its surrounds were an integral part of the lives of the indigenous people, the local Bunarong tribe. Following a seasonal trail, the Bunarong people lived in harmony with nature. It is thought that aboriginal occupation of the Frankston area may have spanned more than 40,000 years. There can be no doubt that the original inhabitants were gentle, expert caretakers who left little imprint upon the landscape. Aboriginal Affairs Victoria holds records of three shell middens and two scarred trees in the vicinity. As far as can be established, the area has not been surveyed for archeological sites 1. Rapid environmental changes occurred as European settlement escalated. The first white visitor, Sir Charles Grimes, a surveyor, met with a party of aborigines near the creek. This is commemorated by a plaque near the mouth of the creek. Abundance of game attracted early settlers. Efforts were made to reclaim low lying areas for farmland. Mouth of the creek was a safe haven for boats; a small fishing fleet were moored there. Regular catches of bream. Serious efforts were made to drain the swamp. 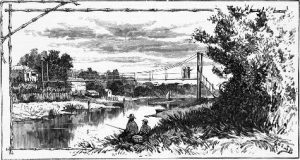 In 1879, the Patterson Cut was made, a 10 metre wide channel linking Carrum Swamp to Port Phillip. In 1891 after heavy flows, the Patterson Cut was washed out and became the river we know today. The Patterson River fulfilled its role of draining the swamp. This effectively cut off the flow of water into Kananook Creek. Silting of mouth and creek due to reduced flow of water along the creek. A major headache for fishermen. At times they could not move their boats across the sandbar. Fish kills reported. Creek smelly. A lock was built at mouth of creek at Davey St in order to increase the head of water. This could be quickly released to scour the creek and keep it clear. Lock remained until 1920’s. Various siltation prevention measures attempted. Kananook Creek reduced to a foul smelling drain. Pumping station constructed near Seaford Railway Station. A large intake pipe carried seawater from the bay into the creek. (Seaford pier was built to support the pipeline). Worked well but expensive to operate. Fell into disrepair during the war. No sewerage, no flow and full of septic and sullage waste. State Rivers and Water Supply Commission pump and outlet at Riviera St. Intended primarily to carry high water flows from creek into bay. During high tides a small amount of sea water was flushed into creek. Kananook Creek Association formed by a group of concerned residents with the desire to clean and restore the creek and surrounding reserves. Treated effluent from Mornington Peninsula Sewage Treatment plant was flushed into creek via Eel Race drain. Catchment area was sewered. Water quality began to improve. Stagnation problem remained. DVA built pump station at Patterson Lakes to pump clean sea water into the creek via Patterson Lakes Tidal Canal System and Eel Race Drain. Increased flushing and significant improvement in water quality and clarity. Fish and animal life began to reappear. Wildfire swept through the northern section between Eel Race Road and Station Street, destroying much of the vegetation. In response, KCA volunteers embarked upon a vigorous campaign of weeding, replanting and fire prevention measures. Mornington Peninsula Sewage Treatment Plant closed. All effluent directed to the Melbourne South Eastern Purification Plant and discharged at Cape Shanck. Dandenong Valley Authority merged with Melbourne Water. DVA / Melbourne Water and Frankston Council. Welcomed by the KCA, the plan recommended strategies for future management and identified responsible authorities. Kananook Creek Reserve Landscape Master Plan prepared for Frankston City Council. Plan builds upon the recommendations of the Management Plan. Controversy surrounded Port Phillip Coastal Trail and proposed location of bike path through parts of the Kananook reserves. KCA opposed and continues to oppose such plans due to the environmentally fragile nature of the reserves. National Heritage Trust Grant approved for KCA restoration of flood plain in the central section of the reserves. National Heritage Trust project completed. Environmental Impact Assessment Final Report completed for the Upgrade of the Riviera Flood Complex on Kananook Creek. KCA awarded 2004 Regional Landcare Award by Port Phillip and Westernport Catchment Management Authority. Kananook Creek Association were the honoured recipients of the ‘Caring for Waterways’ Award. Completion of the Fiocchi Ave to Beach St section of trail directly linking the reserves to the business district. The creeks reserves are now accessible for more than 7.5 km from Carrum to central Frankston. The KCA were the proud state winners of the NAB Volunteer Award (Environment category). Later events will be added shortly. 1 Sites are protected regardless of whether or not an archeological survey has been carried out.